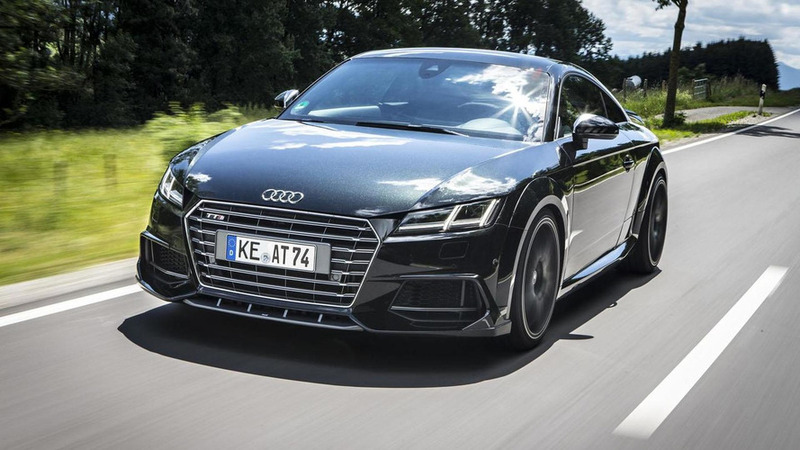 ABT Sportsline has unveiled their new tuning program for the Audi TTS. Starting under the hood, the turbocharged 2.0-liter four-cylinder engine has been equipped with an optimized ECU which enables it to produce 370 PS (272 kW) and 460 Nm (339 lb-ft) of torque - an increase of 60 PS (44 kW) and 80 Nm (59 lb-ft). ABT declined to say how fast the car is but the standard TTS accelerates from 0-100 km/h in 4.7 seconds before hitting a limited top speed of 250 km/h (155 mph). Besides the upgraded engine, the TTS can be equipped with a front spoiler, new mirror caps and a rear wing. Customers can also order a gloss, matte, pearl or metallic wrap as well as 18- to 20-inch alloy wheels. Other options include a four-tailpipe sports exhaust system, Alcantara upholstery and sport springs which reduce the ride height by 35mm front and 30mm rear.